with ART of AMERICAN HISTORY! Contact Us Sign our guestbook below! The Rockland Historical Society: May - July, 2014, More details to follow. 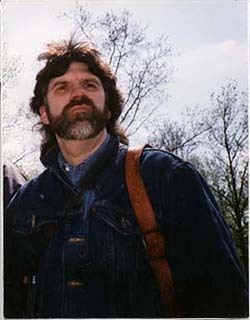 Mr. Martin was featured at the Rich Mountain Battlefield Foundation's "The First Campaign Seminar and Reunion" in Beverley and Elkins, West Virginia. Martin has been a member of the RMBF for over ten years and was invited to exhibit a special one-man show at the Randolph County Community Arts Center. 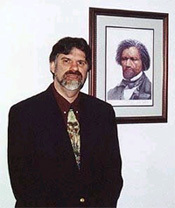 Opening on August 17, 2006, the exhibit showcased several dozen of Mr. Martin's Civil War artworks and was on display through the middle of September. A portion of the proceeds of all sales will be donated to the RMBF and the RCCAC. The show included several NEW works and prints created specifically for the RMBF. Mr. Martin Honored by the VFW! 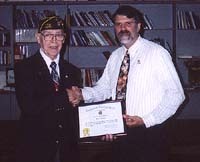 Paul R. Martin III was just recognized by the Veterans of Foreign Wars for his efforts to honor veterans. Paul R. Martin III, IN THE NEWS! Mr. Martin's Gettysburg Landscapes capture the thought-provoking nature of the battlefield as he views it today, with images that create a visual, and sentimental connection between the present-day visitor and the historic events and dramatic conflict of the past. It is his ultimate goal to evoke the many human emotions that are felt out on the battlefield and to transcend those emotions with imaginative and creative visions. Mr. Martin’s historical portraits attempt to capture accurately realistically the dignity, humanity and physical traits of the personalities depicted. Inspired by the tragedy and the triumph of the lives of America’s military and national heroes, the portraits are respectfully hand drawn from period photographs available from national archives and museums. They are meant to honor the men who lived their lives with integrity, pride and compassion. (shown here) "Save That Of Honour"
"The Civil War Battlefield symbolizes the strength and grandeur of our Nation, forged by fire and reunited after five terrible years of war. The bronze and granite sculpted warriors stand as timeless witnesses to the struggle that raged across the landscape at that time. They remind us of the great cost in human lives exacted upon our Country during those tumultuous years. My research and understanding of the horror and sacrifices that took place there, combined with the spiritual and tranquil beauty of the quiet fields, has inspired my works." 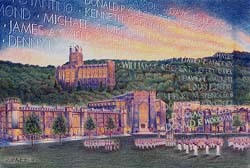 (shown here) "The Soul Of Honor"
Mr. Martin's West Point images celebrate the rich history of the Academy. For 200 years, The United States Military Academy has been the premier institution in the world for nurturing the military leaders and heroes of America. From the Mexican War to the Civil War, through World Wars I and II, to Korea, Vietnam, Desert Storm, Afghanastan and Iraq, the Long Gray Line has rendered selfless service to our Country with Duty and Honor. The Academy continues to prepare leaders for the difficult role of defending America and the world against the fanaticism of modern day terrorists. 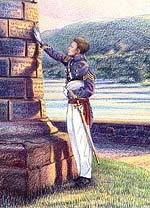 (shown here) "Bond Of Brothers"
Rendered with color pencils in the dramatic and spiritual style of the Hudson River School, Mr. Martin's drawing style utilizes novel color pencil techniques. Multiple layers of primary, secondary, and complementary colors are repeatedly overlapped with a crosshatching technique, creating infinite hues and rich dark values without the use of black and brown. Dozens of layers of color combine to give each drawing a sense of vibrancy and depth, and an impressionistic quality that he feels expresses perfectly his artistic interpretation of the battlefields, portraits and landscapes. Mr. Martin's Revolutionary War Series commemorates the rich revolutionary war history of Colonial America and honors the Patriots who fought and sacrificed for their freedom and independence from oppression. They celebrate the strength, dignity and indomitable resiliency and spirit of the American people, then AND now. Mr. Martin's WWII montages honor the efforts of our citizen soldiers, who from 1941 through 1945, stopped cold the tyranny of Hitler’s Nazi Germany in Europe and the Japanese Empire’s aggressions in the Pacific. On battlefields across the globe, they courageously picked up their guns, not to conquer, but to liberate, not to destroy but to restore, and “did nothing less, than save the world." Many artists have illustrated the battles of the Civil War. PAUL R. MARTIN III has created Civil War Art inspired by the emotional feelings aroused by the wonder and tranquil beauty of the battlefields themselves. 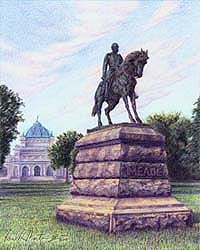 MR. MARTIN's perspective on Civil War Art focuses on the landscapes and monuments of the battlefield. His provocative full color drawings are a contemporary approach to a romantic theme; contemplative and meditative while paying tribute to the valor and honor of the men who fought and died there over 135 years ago. They are respectful of the heroic deeds but also attempt to reflect the awareness of the tragic, sorrowful and poignant atmosphere that pervades the now silent fields. Recently Mr. MARTIN has focused his talents on other periods of American History. Several USMA at West Point pieces have been created and published as prints. 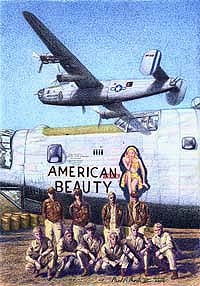 A commission from the Yorktown Historical Society has yielded a new Revolutionary War print and Mr. Martin has just started a new WWII series of artworks including "American Beauty", a gift for his Father-in-Law, S/Sgt. Michael J. Fevola. PAUL R. MARTIN III is a professional artist and freelance illustrator who received his training at Southampton College and Long Island University. He also teaches High School art in the Pearl River School District in Rockland County, New York. He has exhibited his drawings and paintings throughout the East and the New York Metropolitan area for the past 20 years. 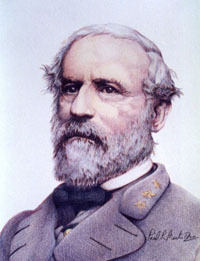 His original artworks and prints are on permanent display at the Robert E. Lee Civil War Research Center and Library, The Civil War Library and Museum of Philadelphia, Herbert Alumni Hall at West Point, The Pentagon and hundreds of private collections throughout the country and the world. Major one-man exhibits of his works were held at the Gettysburg Cyclorama Visitors Center Gallery in 2000, at West Point in the United States Military Academy’s Class of 1929 Gallery in Eisenhower Center in 2001, at the Union League Club in New York City in February, 2002, the Randolph County Community Arts Center in Beverley West Virginia and numerous Libraries, Galleries and re-enactment and living history events. 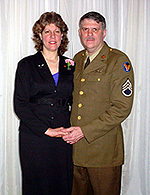 He has received commissions from the United States Military Academy, The General Meade Society of Philadelphia, The Sons of Union Veterans, and The North Carolina South Mountain Monument Fund. 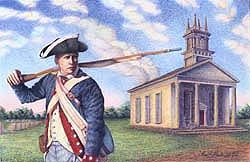 He is currently working on a painting for the Kernstown battlefield Association. 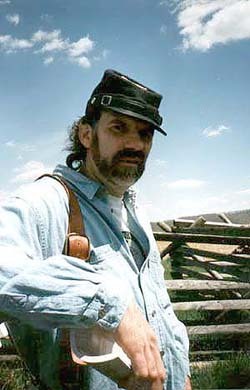 His painting “The Wheatfield” was just used as the cover for Jay Jorgensen’s book, “Gettysburg’s Bloody Wheatfield” . “The glorious spirit of Mr. Martin’s imagery, and his command of light, makes his artwork glow! 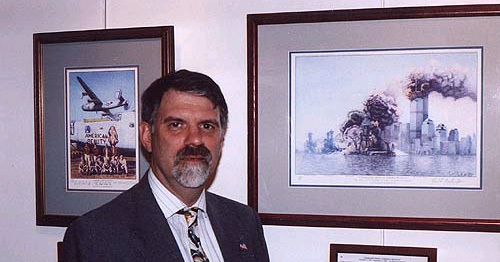 Paul R. Martin III has a strong love of American history and a great appreciation for the heritage of our country and the sacrifices that were made for freedom. Mr. Martin feels very strongly about the importance of preserving our heritage, now and for future generations to come. Because of this belief he takes an active role in Civil War and Historical preservation and monumentation. 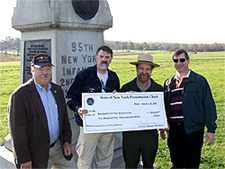 Mr. Martin serves as President and Program Director of the Rockland County Civil War Roundtable and in that capacity he secured a $250,000.00 grant throught the NY State Senate to restore and repair EVERY NY State Monument on the Battlefield at Gettysburg. (Photo above right.) Gettysburg LBG and Rockland County Sheriff James Kralik, RCWRT President and Artist Paul Martin, and RCWRT Treasurer Terrance Harper present a check for $250,000.00 to Gettysburg Park Superintendent Dr. John Latschar. 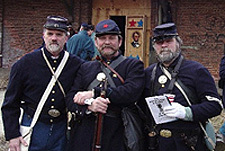 (Photo left) Paul Martin, with James Shockley and Dave Topps of the 150th NY. He currently is a chairman on the Yorktown Citizens Veterans Day Parade Committee and an Assistant Scoutmaster in his son's Troop 164 in Yorktown Heights. In keeping with his commitment to preservation and memorialization, a portion of the retail sales of ALL of Mr. Martin’s Civil War prints are donated to several Civil War preservation and memorial funds and the USO. Publishers’ proofs of each print are also set aside as charitable donations to various preservation and memorial funds. Thank You for visiting our website and for your kind consideration of MR. MARTIN's artwork. His wonderful art prints will make a fine addition to your collection or a great gift for someone who shares your passion for Civil War or Historical Art. Please sign our guestbook below, add us to your favorites and visit us again. We hope to hear from you soon. to go to site map. We Support our Troops! You can too! For great Navy and Patriotic T-shirts, mugs, et al.